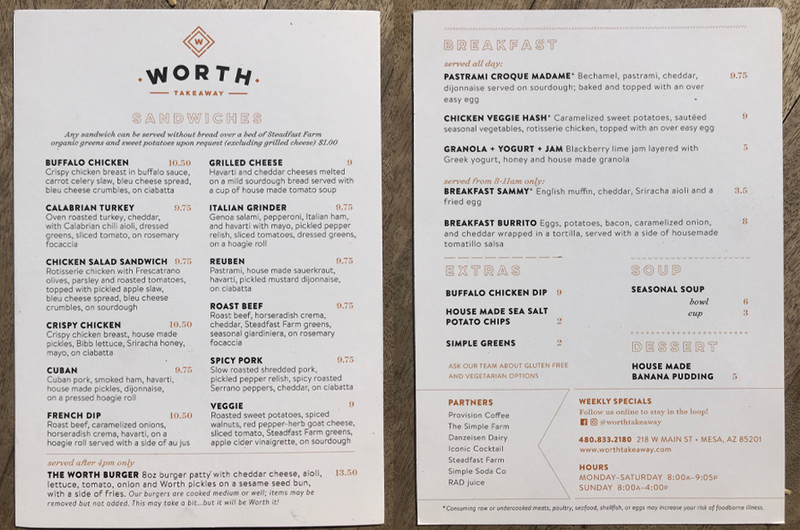 This gem in downtown Mesa, called Worth Takeaway, is the ninth dog-friendly restaurant we visited for our blog. Stopping in at 8:15 AM on a Saturday morning was a quiet time of the day. Foot traffic started to pick up around 9 AM but the restaurant still had a calm and peaceful feeling. I will do my best to explain the remarkable qualities of this restaurant’s location because it offers a completely different feeling than any of the other restaurants we have visited before. This restaurant has a magical feel. It is located on Main Street near the Valley Metro Light Rail station at Country Club Drive. With every passing metro light rail, you hear the sounds of motion and feel the sensation of life happening all around you. There were locals walking into the restaurant on foot and a kid whizzing by on a skateboard. I felt part of a community. I felt connected even though I was brand new to this place. I could tell the foot-traffic has their routine to stop in to grab their breakfast or soda and be on their way. This location makes it easy to join in with locals in the community. And that is reassuring in today’s busy life to be able to step back and connect with humankind. If you are in the mood to strike up a conversation with a new friend, this is the place. Mesa is the third largest city in Arizona, after Phoenix and Tucson. The current population of Mesa is 484,000 people. A surprising realization while seated at the patio at Worth Takeaway was that I had the same hometown feeling here as I did when I grew up in the small village of Ovid, Michigan that only has 1,600 residents. Walking up to the restaurant from the side street parking, you will pass by several stores that have some beautifully decorated windows. Even though some of the stores are vacant, you can still see the beautiful window lines and imagine someday there will be something unique and interesting to feature. The nostalgia feeling of being in an old-fashioned small town is worth the trip. And the different food choices are worth the trip over and over. The menu offers so many mouth-watering options to satisfy most taste buds. When your significant other asks what you want to eat and their preference at the moment is completely opposite of what you want, such as BBQ and Italian, this restaurant can happily satisfy you both. How nice is that! And, I love that the breakfast menu is served all day. 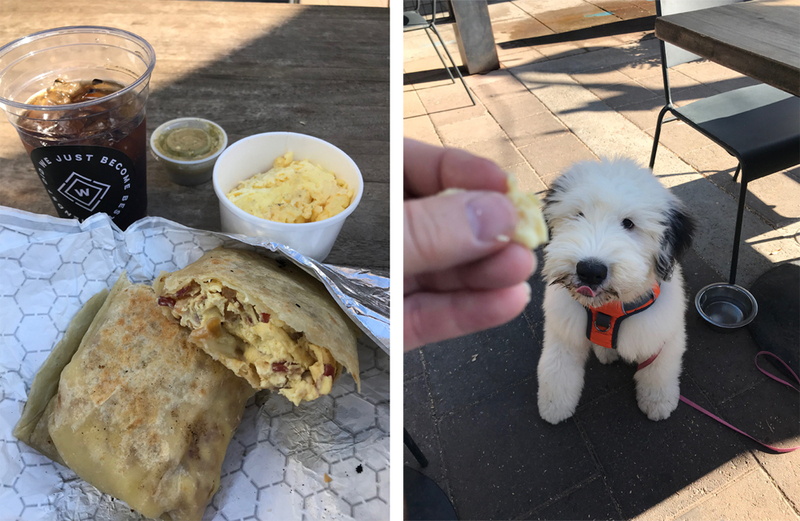 I had the breakfast burrito and it was delicious! 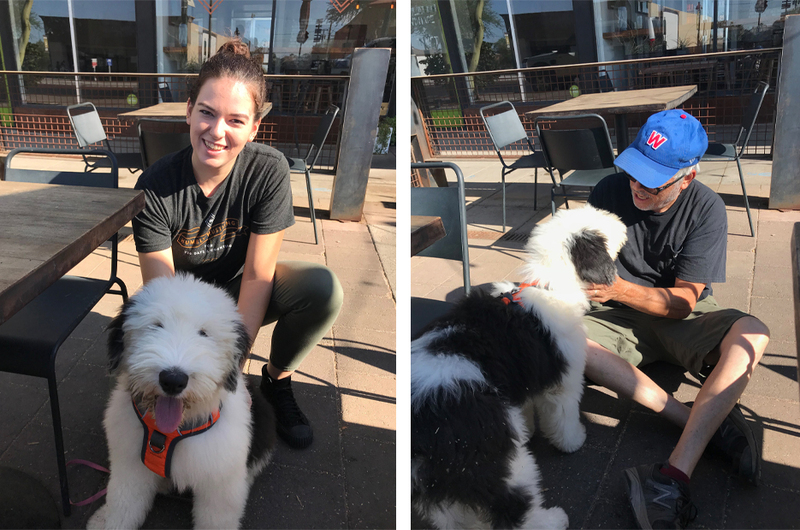 Wrigley, our Old English Sheepdog puppy enjoyed a side of scrambled eggs. They were served in a to-go cup. Wrigley could have been fed the eggs from his to-go cup but he got little bits at a time as a reward and a treat for his good manners and to help with his puppy training. Notice the catchy phrases on the food packaging: “Did we just become best friends?” and “We belong together.” What a clever way to make a diner feel welcomed and appreciated. This is a great place to help Wrigley, who is only three and a half months old, to experience many unique sounds and different kinds of people. The Worth Takeaway server, Cayla, enjoyed giving Wrigley some extra love. And a couple of other people stopped at our table for a moment to offer Wrigley human affection. There were several moments to praise Wrigley for accepting different stimuli. These types of new opportunities are great for helping your dog fit in wherever they join you in life because they learn to accept different sounds and people. If you have a puppy or shy dog, this restaurant is a great place to help your dog learn appropriate responses by offering them praise and treats when they greet a new person nicely. The patio is small and cozy, like all the store front patios on Main Street. There are shade umbrellas and shade under the tables for your dog. We were both fully shaded in the morning. The patio is directly next to parallel parking on Main Street, again adding to the life-filled environment and stimulus that helps you feel a part of positive energy of the historic Main Street area. We loved that we saw other dogs walking with their owners and that our Main Street experience was super dog-friendly. As with all our pet-dining experiences we comment on the bathrooms because you might need to use one. Plan in advance if you normally use the bathroom at restaurants because you will not be able to take your non-service dog inside with you at Worth Takeaway. Seven blocks to the east, less than 2-miles, there is Pioneer Park, a beautiful 18-acre park that has outside public restrooms. It also has some cool playground equipment and a splash pad for kids, plus lots of grass and shade trees perfect for you and your dog! 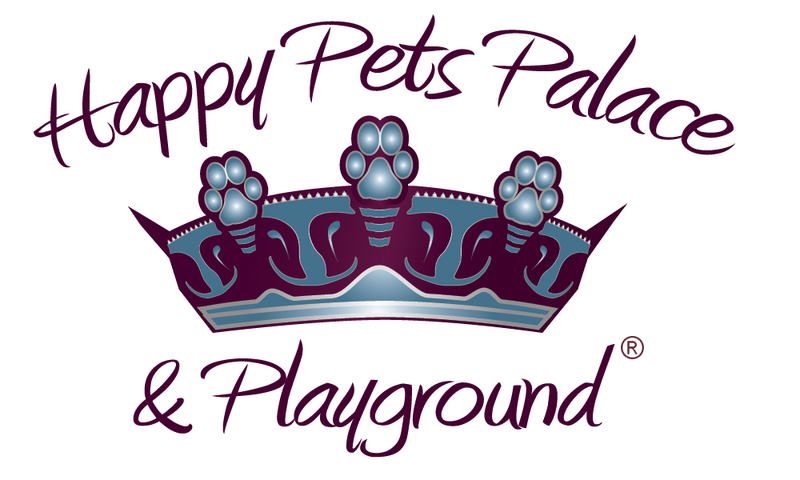 Happy Pets Palace offers doggy daycare, boarding and puppy training in Mesa. We are opening two new locations in Fall 2018, one in Gilbert and another in Chandler. Our clients treat their dogs like family. They enjoy outings with their dogs. 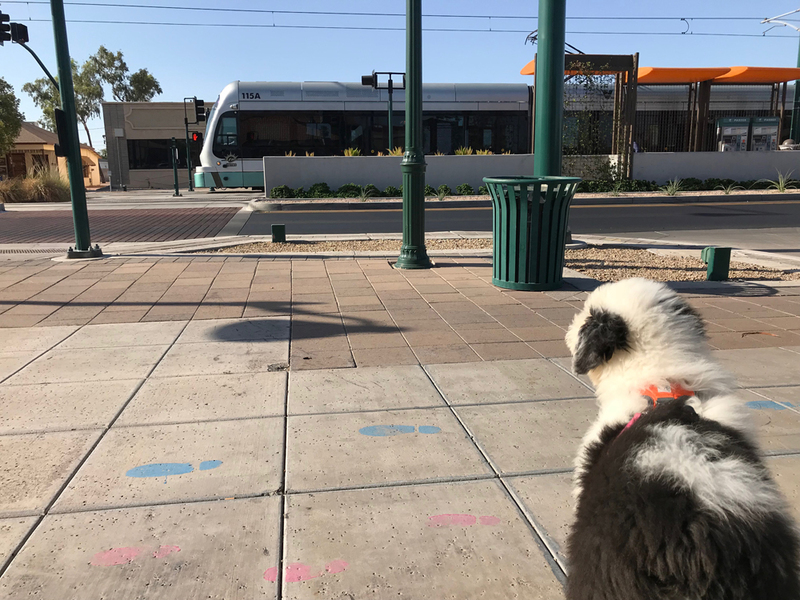 We like blogging on different dog-friendly restaurants in the Mesa, Gilbert, and Chandler area so we too can also experience our neighborhoods. We post our schedule on our website www.happypetspalace.com under Calendar of Events if you want to see where we’re going next. You can also learn about our previous restaurants experiences here. And to help people passing through town or wanting to become more familiar with our area, we post our reviews on https://www.bringfido.com/.